Chandler-Gilbert Community College (CGCC) Performing Arts has not let pending technical upgrades to their facility keep them from finding the “perfect fit” performance for this fall’s production. Circle Mirror Transformation by Annie Baker is the type of character-driven play that Theatre Arts Director, Tracy Liz Miller knew her students and her theatre could do to perfection. “Director Kent Burnham suggested this wonderful play by Annie Baker, knowing that we had some terrific older students in our classes that are ready for their opportunity on the stage,” shared Miller. “It's a perfect fit for our department right now for the students and as we wait for our new dimmer rack and additional equipment." This the first time CGCC Department of Theatre has produced a fall production in their Studio Black Box and have chosen this low-tech, character-centric play to fit into the space as they wait for additional technical upgrades for more technically sophisticated productions. The play is layered with intrigue. When four lost individuals who enroll in Marty's six-week-long community-center drama class begin to experiment with harmless games, hearts are quietly torn apart, and tiny wars of epic proportions are waged and won. A beautifully crafted diorama, a petri dish in which we see, with hilarious detail and clarity, the antic sadness of a motley quintet. 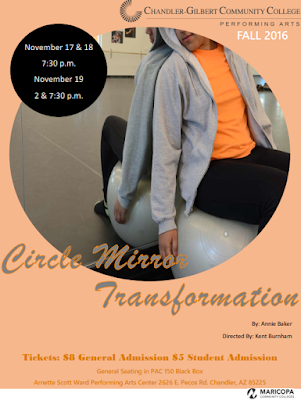 Circle Mirror Transformation by Annie Baker is showing at the Arnette Scott Ward Performing Arts Center located at the CGCC Pecos Campus on November 17th & 19th at 7:30pm with a matinee on the 19th at 2:00pm. Tickets are $8 general admission and $5 for students. For more information please visit the website at www.cgc.maricopa.edu/performingarts or call the box office at 480-732-7343.